Egyptian Chronicles: #Ramadan Arabian Nights 2016 : King Rokn El-Zaman's tale "Ep.9"
Now things are getting more and more interesting in our tale , the tale of King Rokn El-Zaman. Tonight is our 9th episode from our Radio Arabian Nights tale this year. To be honest , I was worried about how Abbas El-Aswan would fill the place of Taher Abu Fasha as the writer of One thousand and one Nights radio show but so far he did a great job. Enough of the chitchat, I know that you only care for the episode and so here it is after the break ;the 671st episode of the longest running Radio Drama show in the history of Egypt. As he knew that he was on the verge of being fired because of his corruption , evil Vizier Samsem confronted Crown Prince Safwan with his true identity in order to force him to work with him. The evil Vizier wanted to get rid of the king but Safwan rejected the idea but Samsem reminded him of his real parents : Dahman and Kawkab. Samsem wanted to kill Rokn El-Zaman but Safwan was hesitant. Samsem told him then if the King knew his true identity , he would appoint Hassan as a Crown prince. Fearing the loss of the throne , Safwan joined Samsem in his evil quest but he told him that instead of killing the king , they would think of something less evil. Samsem also made it clear to Safwan : If he thought of getting rid of him , someone else would reveal his true identity to the whole kingdom. 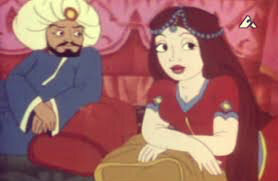 Safwan then revealed to the evil Vizier that his father was going that night alone undercover to check on the citizens of the Kingdom and Samsem got an idea. Back at the Palace , Queen Nourhan is worried about her son Hassan's condition and how he loved the Shepherd girl. The Queen is hoping that he will forget the girl and then she summons him. Nourhan then tells her son that he should go on a trip somewhere in order to have experience for months. Her son is hesitant because he will leave his beloved Shoms. The Queen convinced the King with her plan. He told her that he would order Shahbander Rashdan to include his son Prince Hassan in his trade cruises. Meanwhile , Shoms' uncle wants to go and to complaint the advances of Prince Safwan to his niece but Shoms is afraid. Thus her uncle , the Shepherd decides to leave the place once again and head to somewhere far away. Back to the Kingdom, King Rokn El-Zaman started his daily undercover trip , a wicked plan was prepared for him by Safwan and Samsem. Samsem's assistant waited till the king left the Palace undercovered as a poor man arresting him in the street for being a thief !! Despite his scream that he was the king , nobody believed Rokn El-Zaman and he was sent to jail. Wonder what will happen in tomorrow's night !? ?